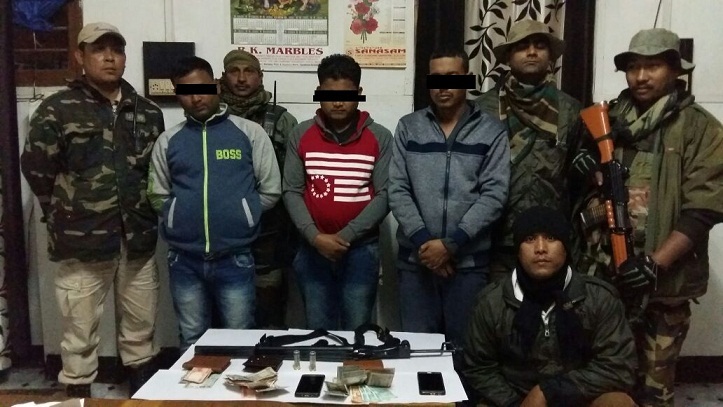 In its continued efforts towards drugs and crime free Manipur, 26 Assam Rifles and 39 Assam Rifles along with Thoubal Police Commandos nabbed three notorious drugs and weapons smugglers on Saturday. The smugglers tried to escape from a joint cordon of Assam Rifles and Thoubal Commandos near Slopeland in Thoubal district on Saturday. A double barrel shotgun, two mobile phones, two live rounds and Rs. 9,710/- in cash were recovered from the smugglers. Following interrogation of the smugglers it was found that they were involved in peddling of drugs and were also waiting for an opportunity to kidnap government employees for ransom. The smugglers were handed over to Thoubal Police for further steps. In another development, troops of 11 Assam Rifles conducted a lecture on “Importance of Sports” at Thangbung Minou village, Tengnoupal District on Saturday. A total of 43 villagers (24 Males, 07 Females and 12 Children) attended the programme. The aim of the lecture was to make the local populace aware of the importance of sports and the other facilities available with the Company Operating Base Thangbung Minou for sports lovers of the village and other nearby areas.